Members of a local service club were somewhat amazed recently after they added up some numbers – and made it to a million. 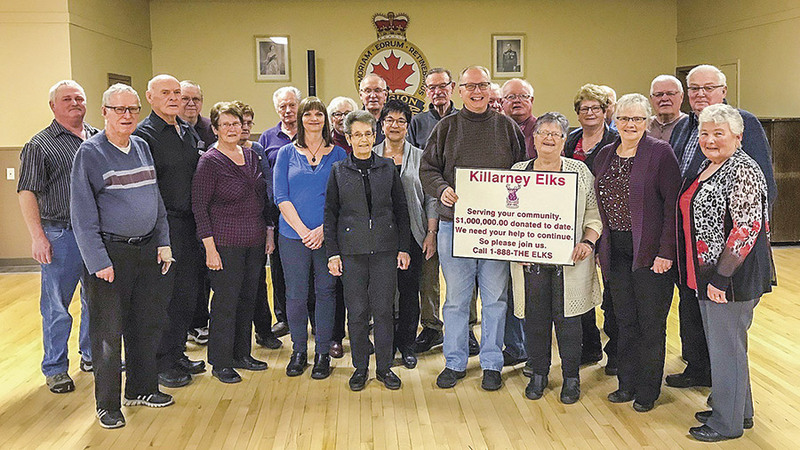 It turns out that the Killarney Elks #238 have compassionately handed out $1 million in donations to community causes since their inception way back in 1937. The Elks sponsored the annual Elks Provincial Bonspiel here at Killarney’s Shamrock Centre, from Friday to Sunday, January 11 to 13. Elk lodges around the province take turns to host the bonspiel each year, said Lamb, and it’s also a great time to meet and mingle with other members. The Ninga Café ladies served up a roast beef dinner, with great desserts, she added, and 55 Elks sat down together for the wonderful meal. And if you love helping kids, and your community, it might prove a good fit, said Lamb. To find out more about the Elks and the charitable work they do, and what joining them might be like, you can contact Marilyn Lamb at 204-523-8388. You can also call the Killarney Elks Exalted Ruler, Delores Mason, at 204-523-8588. MARKING A MILLION DOLLARS – After hearing the news that the Killarney Elks Lodge #230 had recently surpassed a million dollars in donations to local causes and kids since 1937, the Altona lodge decided to create an award of recognition for the gang. Holding it (left) is Guy Mullen, Exalted Ruler with the Altona Elks, as he hands it over to Delores Mason, Exalted Ruler for the Killarney Elks, on Saturday evening at the Legion Hall.